Smoky the Bear says only you can prevent them. We try to heed our furry friend's advice, and yet, they happen. Fires are a fact of life. But how to better prevent, slow and stop them is a hot topic across the west this summer. Central Idaho state representative Dorothy Moon said half of Boise County burned last year in a timber fire. A decision to allow timber harvesting had been held up in court for eight years and when the green light was finally given, "guess what, it catches on fire," said the republican lawmaker. "A lot of people suspect it was arson." Moon said neighboring Custer County, where she lives, which is "bigger than most eastern states," consists of 97 percent federal land. The almost 5,000 square mile land mass is home to less than 5,000 people whose livelihoods "have been under attack for decades," because of their inability to harvest trees, she said. Trees that eventually become fodder for fires. 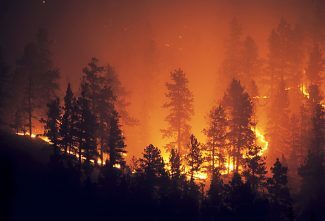 Tom Troxel, the executive director for the Intermountain Forest Association, a Rapid City, South Dakota-based group that advocates for "healthy forests and healthy communities," said fires in the Black Hills were minimal this year. Congress and a new U.S. Forest Service chief (under the U.S. Department of Agriculture) is focused on taking better care of forests across the west, which should help minimize future fires, Troxel said. Earlier this month, Secretary of the Interior Ryan Zinke announced his agency would "adopt more aggressive practices, using the full authority of the Department, to prevent and combat the spread of catastrophic wildfires through robust fuels reduction and pre-suppression techniques," but what this means, from a practical standpoint, has yet to be seen. "There's a lot of recognition in the Forest Service that they need to be doing more fuel treatment, more management, more timber sales. All of these actions will help reduce the risk of fires," Troxel said. H.R. 2936, the Resilient Federal Forests Act of 2017, introduced by Arkansas Representative Bruce Westerman in and approved by the House Natural Resources Committee in June would provide protection to the national forest system by implementing proactive management standards intended to lessen the threat of wildfires and other risks. S 1731, introduced by Senator John Thune (R-S.D. ), calls for immediate thinning, salvaging dead and dying trees, and more to improve forest health and wildlife habitat. The legislation would be a big help, Troxel said. "They are on the right track and it's totally possible and something we should be investing in because it's the only way we will get out of this nasty cycle we are in." 1. Thinning overstory (tall trees) so that they aren't touching one another at the top. "Most of these are commercial trees that can be harvested and taken to a sawmill and used that way. As an extra benefit is that thinning is exactly the same thing you do to reduce the risk of mountain pine beetles," Troxel said. 2. Thinning and removing ladder fuels – smaller trees (10-20 feet). 3 Removing or treating ground fuel (dead trees, limbs, grass) by piling and burning or "mastication" (grinding). Carrying out that management on a large scale is what will make a difference for fire prevention in the long run, said Troxel. "You don't want to be out there doing a project that treats 50 acres. You want to do it on a scale of 1,000 or 5,000 acres where you can cover some country and make a difference in the event that a fire starts." Black Hills National Forest deputy fire staff officer Jason Virtue agreed that aggressive measures are underway in the Black Hills to manage the forest. "We've been number one in the nation for volume of timber sold. We're making great strides," he said. Logging helps keep fires from getting out of control, and weather is also a major factor, he said. An active timber market with the infrastructure to utilize the trees helps keep their logging program successful, he added. Longtime southeastern Montana rancher Curt Terrett said in his neck of the woods — and prairie — coal seams left burning from previous fires are significant fire hazards in dry years like this. "It's a little seam of coal, maybe only a foot thick, exposed in a creek bank or something," he said. "A lot of them got ignited during fires in 2011 and 2012 and that coal just continues to burn underground. The ground sloughs off, and when the conditions are right, they can ignite a new fire." Coal seams are seemingly everywhere in his part of the state. "There are hundreds of those things left over from those fires," Terrett said. "We don't have to have lightning or unfriendly tourists to start a fire." It was a burning coal seam that set off the Sartin Draw Fire that burned about 100,000 acres in his neighborhood this summer. Terrett said the coal seam fires can be extinguished, but it's expensive. Still he would like to see the federal government work to put out the ones on agency land – he estimates there are hundreds on BLM and USFS land – and he would be supportive of some kind of federal program that would help finance the same kind of thing on private land. In order to put them out, a large excavator like a trackhoe needs to uncover the "burden" over top, then dig down to the coal that is currently burning, lay it out on dirt and let it burn itself out. Then the hole should be filled back in, he said. Twice the normal rainfall amount in 2011 resulted in excess grass in 2012, said Terrett. That's when he battled the Ash Creek Fire for nearly two weeks on his private land and grazing allotments. Side by side with federal firefighters, he fought the blaze with his cat and road grader. "We did everything, and they helped us do everything we could to stop that thing for 12 days. There was nobody dragging their feed on putting it out, but you just can't fight Mother Nature." The fires that get big in his region are weather-driven, Terrett said. Another contributing factor to the large fires of recent years is the excellent fire fighting for the previous 70-80 years, he said. "We all knew it was going to happen eventually," he said, adding that additional grazing might not make significant impact in fire prevention, but that logging would. "It's more about the amount of timber." Montana state senator Steve Hinebauch from the Wibaux, Montana, area, said that there were a couple of prairie fires on BLM land in his home community this summer. "They are always worried what someone is going to say about plowing a road or doing a fireguard instead of just stopping the fires. But they weren't quite as reluctant this time as they have been in the past." Hinebauch, a rancher, said communication between federal firefighting chiefs and local departments needs to improve. He traveled to a fire about ten miles from his home this summer and two local fire departments were called, and when they all arrived at the fire, they learned it was basically contained. "It cost them (the local departments) a lot of money, there were 10 our 12 people in each department, and the BLM was lackadaisical about how they handled communicating with us." Worse yet is the inability of federal firefighters to traverse Wilderness Areas to put out fire, he believes. "That big fire up by Jordan that burned 250,000 acres, there were 17 fires that started that night. They got all but three put out but those three were on Wilderness Study Areas where they can't take motorized vehicles to fight them. So by the time the fires got to the edge, they couldn't stop them. They burned cattle, homes, equipment, grass and a lot of fence." “That's the biggest problem I have with what BLM does, they allow fires to burn and then they get out of control where nobody can stop it. "We're going to introduce a bill in the state legislature this year to allow more local control," said Hinebauch. He's hoping to find sufficient support for a bill that would allow the local fire marshall or possibly the sheriff to give the go-ahead for local response to fires on federal lands. "We've tiptoed around this for too long. The feds are not handling fires correctly in many cases. That's one of the reasons I ran for office." Al Nash, the Communications Director for the Montana/Dakotas BLM said when his agency fights a fire, the number one factor is safety. "The priority for us obviously is safety of the firefighters, safety of the public. We look at where the fire is, the types of fuels, weather plays a big part in our plan — that dictates how active it will be. We have to look out ahead of the fire, and I'm thinking not only in hours and minutes but days, as to how that fire could end up." BLM and USFS firefighting tactics most often are "pretty satisfactory," said Terrett, but he would like to see the agencies, as a general rule, utilize local help more – both from a physical standpoint as well as from a knowledge and experience standpoint. "To me if there is an issue, it's the fact that none of us local people that have any real experience with that kind of thing have any authority to make any decision as to whether or not we ought to just take a dozer and go to work." In the past, when he spotted a fire on federal land, he would often put it out or call the local fire department for help to put it out, but he no longer does that as the federal agencies frown on that, he said. The hoops the agencies are required to jump through often times let the fire get bigger than necessary, he believe. "By the time you report it and they dispatch calls to whoever they need to call, and they get here, they have to do a 'size up' and then they decide whether or not they need a piece of equipment, then they call for dispatch. It could be couple of hours before someone gets there, and it depends how far away they are and how ready they are," Terrett said. "I really just wish that there was a way that they could allow some of us people to have a little bit of authority or a bit of leniency on what we do and when we do it." Terrett actually reported the Sartin Draw Fire at 5 am, with a gut feeling that it would get big. His wife had seen the flames from their home, 18 miles from the fire. "If that fire had been on our deeded land, I'd have been out there with a piece of equipment in an hour and we'd have had a hell of a lot better chance at keeping it to 50 acres between six and nine in the morning than we did keeping that one down by 10 o'clock in the morning. At around 10:30 that morning, five hours after he reported it, the fire responders called and asked Terrett to bring his dozer — a machine he has registered with the agency to help with federal land fires. On and off for the past 40 years or more Terrett and his family have contracted with the USFS to help fight fire. For the past seven years, they've maintained a "best value" agreement to use two bulldozers and a road grader, to stop fires, when they are dispatched by the USFS. A basic safety refresher is required each year for anyone contracting equipment. Terrett said the USFS doesn't want just anyone fighting fire on agency land because of liability reasons. Nash said that when the BLM is making a plan for a particular fire, they look at structures as a major priority. "We try to make decisions based on what resources we have to work with at the time and where they would be best deployed. If we have limited resources, we will focus on structures. If it is in among structures, you have to base decisions on what you have to work with and how long it will last – weather, topography, terrain – you can't just throw a fireline in anywhere and expect it to work. You have to be strategic about stopping growth of the fire." Nash added that Montana landowners have a statutory responsibility to suppress fire on their own lands. "We will work together as much as we can on private lands but if the fire is on federal land, that is where federal agencies have to take responsibilities. There are rules and requirements that have to be followed." Wyoming's acting state fire management officer Paul Hohn said sometimes fires on BLM land in Wyoming are extinguished before the BLM ever even knows about them. One priority he must consider is wildlife. "Because we have a lot of sage grouse, our strategy is to minimize fire growth, which aligns generally with local fire departments," he said. "We want to put them out because we want to protect grazing allotments and sage grouse habitat." Still, an abundance of caution reigns supreme. "Sometimes I've been on fires where locals have been trying to get federal firefighters to do things that we see as unsafe like go to the head of the fire, where there are big flames. We want to protect our resources but not if its going to put firefighters in a hazardous situation. Sometimes conflicts arise where people don't understand why we aren't going ot the head of the fire. Sometimes we don't see eye to eye with people." Good communication is the key, said Hohn, and he encourages ranchers and local fire departments to attend their trainings. "That's where a lot of success comes from, meeting before there is a fire." While Terrett does not believe that there is a "let it burn" for "job security" purposes philosophy within federal fire authorities, he said their outlook is different from a rancher's. "When the grass is burning it doesn't make a bit of difference to them. But it is the rancher's livelihood, the rancher's pasture. They don't look at it from a standpoint of the cows being out of grass, they look more from a safety perspective," he said. Grazing lands are on the list of considerations, but not at the top, Nash said. "It's a consideration obviously, grazing lands, sage grouse habitat, all are considerations in determining overall objectives but there's no specific 'we'd better stop this for the grass,' it's always safety of the firefighters, safety of the public, structures," he said. "They might take safety a little farther than is necessary. But then no amount of grass is worth somebody's life," Terrett said.